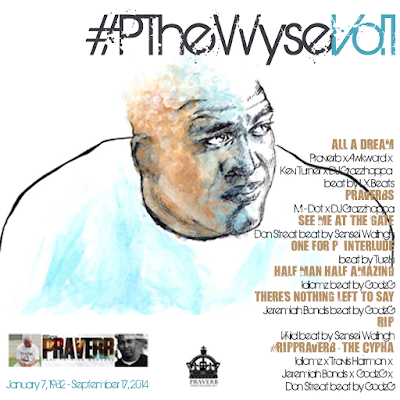 "It goes without saying that all of the artists and beatmakers featured on this project had a relationship with Praverb. Most of which were pretty deep rooted. But what is even more unique is that I have established a working relationship with a majority of these artists and beatmakers as a result of Praverb and him intentionally introducing us at some point. I am honored to be in the company of such artists as Don Streat, DJ Grazzhoppa and Jeremiah Bonds - artists who I have looked up to and admired - and now I can reach out to them personally thanks to Praverb. "This compilation features Awkword, Kev Turner, DJ Grazzhoppa, LX Beats, Don Streat, Sensei Walingh, Vivid, M-Dot, GodzG, Travis Harmon, Tuelv and Jeremiah Bonds. When I initially threw out the idea of the project, there were many more who wanted to participate; unfortunately, we just could not get everyone coordinated. Praverb meant a lot to so many people. "This project has truly been a labor of love. At the end of the day, I just want to see Praverb's legacy live on. This project is just a small way that we can help that to happen."